Properly administered anesthesia should be safe for a normally healthy pig (no heart issues). In the states, there is monitoring while under anesthesia. It should make trimming the teeth easier (able to do a better job). 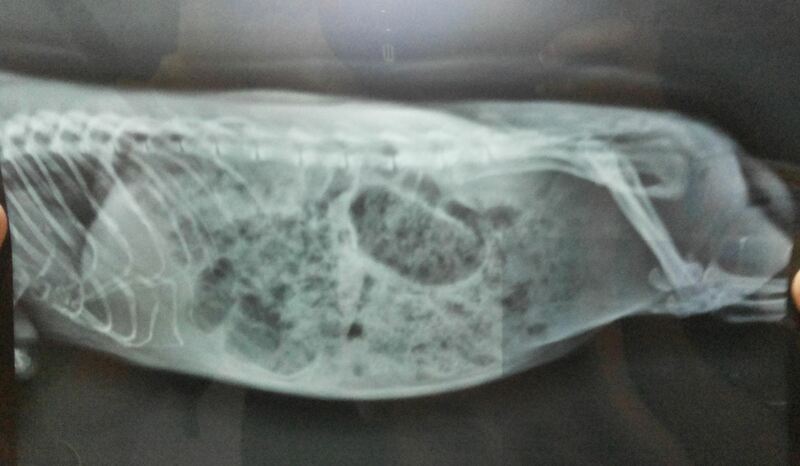 Hopefully there will be no complications and your vet is competent. Thank you sooo much Lynx for the assurance. 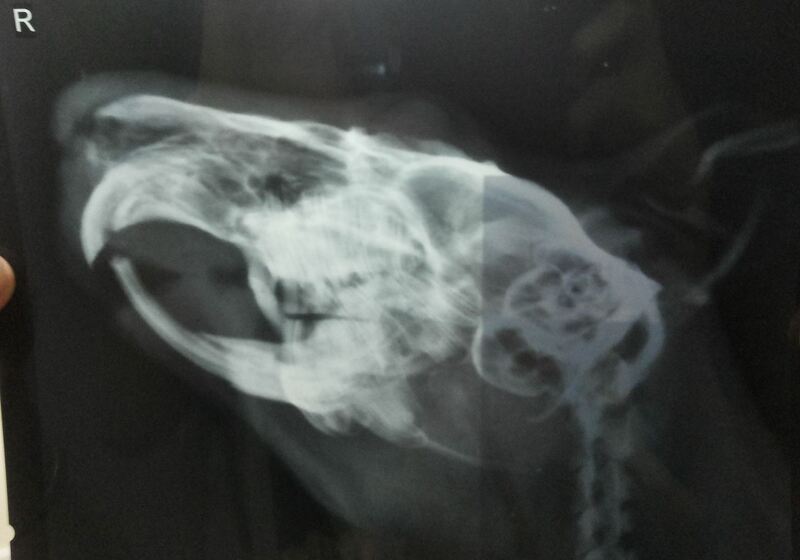 The vet said that they will monitor him during anesthesia and if needed will give him Isoflurane gas. I just searched on the forum and it says that metronidazole is for GI upsets/anti-diarrheal. Should I continue giving him Metrogyl syrup for seven days post surgery? Is there any other antibiotic given to piggies post trimming of teeth like Baytril or Bactrim? Limcee tablet (Vitamin C) are orange flavoured and I read oranges are acidic. Should I exchange it for plain tablets if I get? 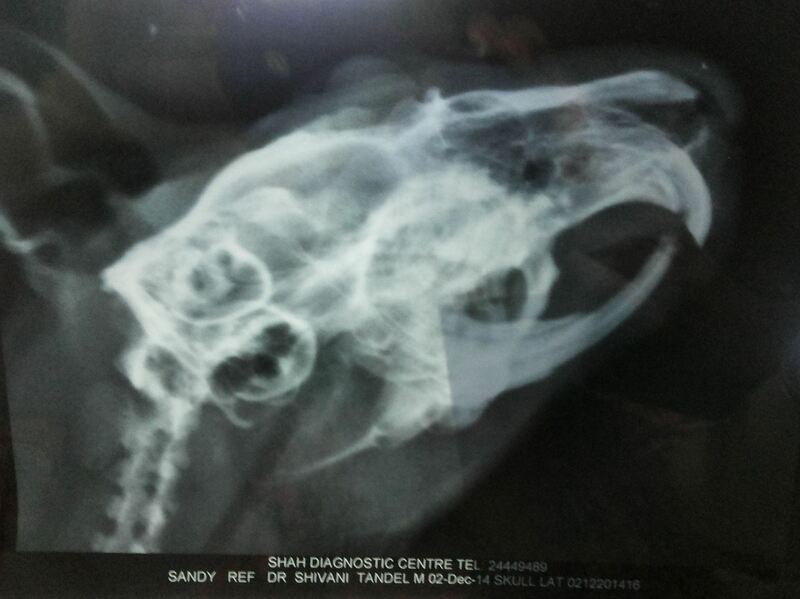 I have sent the x-ray pictures to Lynx. Please feel free to comment what are your observations on it. I will leave answering your more technical question to someone who has more experience than I do. Sandy is eating really less than yesterday and he still hasnt gone in for a surgery. I think the antibiotic have taken a toll on him. Should I discontinue metronidazole and give him some other antibiotic? Please help. He is becoming very difficult to handfeed. He will chew on the syringe for two seconds but when I dispose off the medicines/food he doesnt chew afterwards. Is he swallowing the food or no? He will also kind of sneeze inbetween. Am I hande feeding him the right way and not aspirating him? I am sorry you are having a difficult time. I don't know if you will find the answers you need on the hand feeding or tips page but that is all I have to offer (you need to see chewing motion to have the food going down). He should be chewing while you have the syringe in his mouth -- that way you know he's swallowing. How exactly are you putting the syringe in his mouth? And then what? Thank you Lynx for helping with the pictures. I put the syringe through the side of his mouth behind his incisors and IF he starts chewing the syringe then I dispose the food, otherwise I try to go a little deep near his molars and wait for him to chew the syringe. After putting the food in his mouth, I remove the syringe and allow him to chew the food (which most guinea pigs do) but he doesn't chew or do any mouth movement which shows that he swallowing. He kind of sneezes/removes air from his nose/ mouth at times. Is he actually swallowing? Am I hand feeding wrongly and aspirating him? It sounds like you are doing things right be he is not cooperating. Is your guinea pig weak? Limp? doing very badly? Generally they will make some effort to chew. Does it seem the food gets swallowed? Are you maintaining weight? I think most people don't remove the syringe between bites. If he can chew, I'd just leave it in. He's got plenty of room between back and front teeth for the syringe. Ditto bpatters. If he doesn't particularly like the food, it won't take him long to figure out that if he doesn't chew it, you will take the syringe out and not give him any more. In my limited experience, their mouths will hold about 1/3 of a 1 cc syringe's worth of food at one time. Go deep near his molars and depress the plunger VERY SLOWLY. Don't try to give more than about 1/4 to 1/3 of the syringe at one time. Wiggle the syringe if needed a bit to get him to chew. Then, once he's chewed and swallowed, give him another 1/4 to 1/3. Don't remove the syringe until it needs to be refilled. Be SURE you are using a 1cc syringe with the tip cut off and the rough end smoothed! These instructions will NOT work with any syringe larger than that. If he aspirates, he will cough violently. Of course you don't want to do that, but generally if a guinea pig aspirates there's no question as to what has happened. Thank you so much Lynx, bpatters and Talishan for your help. Lynx, he is doing better now. He couldn't eat properly for almost a week after the surgery but critical care helped maintain his weight. He went in for another incisors trim few days back because it wasn't done properly and his front incisors had grown and started touching his lips. Presently, I cut vegetables in small,long pieces and give him. Bpatters, I will try doing it the next time I have to hand feed him. I just hope he doesn't have to be hand fed ever. Fingers crossed. Talishan, I use a 1 cc syringe. And he doesn't cough but only kind of sneezes. The top incisor of a normal guinea pig will touch (just graze, or touch) its bottom (opposite) lip. Just saying. Yet another tooth problem for my Sandy. After the molar trimming surgery around three and a half months back, he has broken his front incisors twice due to unknown reasons. But this time his lower incisors are moving apart from each other, kind of like separating and loosening from the root. Also while eating, many times one of the teeth will go behind the other and makes it difficult for him to eat. I don’t know the term but I think it is called teeth spurring. Correct me if I am wrong. He is going in for a vet visit tomorrow and the vet suspects he is loosing his teeth but can’t be extracted as she thinks that there can a risk of the new teeth not growing in that place. She said she might have to trim the incisors if they are too long and wait for the teeth to fall on his own. Sandy has reduced his appetite and is hardly eating. I have already started giving him critical care but he is hardly eating that also. 1. What exactly is Sandy’s condition? 2. How can it be treated? 3. What are the things to look out for? 4. If the teeth falls off, will the new teeth grow as separated as the old ones or will they grow back normal? Please help. Any kind of help will be highly appreciated. Be very careful about trimming too short. www.guinealynx.info/teeth_broken.html He may be unable to eat. I hope you can figure out what is causing the weakening of the teeth. I take it you're providing a good diet with lots of vitamin C? New teeth should grow back normal but sometimes it will take another tooth loss to get things back on track. Be sure to weigh daily right now. Ditto Lynx. Handfeed if he's not maintaining weight. In my experience, your vet is right. There are a lot of problems with extracting teeth, incisors in particular. Is he getting sufficient vitamin C? Lynx, I have read that link. Thank you. All my piggies get bell peppers and tomatoes everyday and hay ofcourse. That is what exactly had happened when he broke his incisors twice, he lost one tooth and then another and then his new set of teeth were normal. But this time his teeth are separating. I think the vet applies too much pressure while clipping his tooth which makes it sensitive. She trims it later. This is the only reason I can think of for the weakening of his teeth. I could be wrong though. I will start giving him a quarter of 500mg Vitamin C tablet from today. Talishan, I tried handfeeding the way you and bpatters suggested. I went deep near his molars and dint remove the syringe until it was finished. He was chewing the syringe which meant he was swallowing. But he behaved as if he was choking and was trying to get the syringe out of his mouth. Did I do it properly? Is this how he is supposed to behave? He is eating coriander, grated carrot and hay a little. I will continue giving him critical care and try to give him more today. Handfeeding is a slow, laborious, time-consuming -- but absolutely vital -- process. If you're using a 1cc syringe with the tip cut off -- which you should be -- then give him "bites" of about a third of the syringe at a time. Don't remove the syringe from his mouth, but don't give him the entire amount at one time. Give him about a third of it, then let him chew and swallow; then gently push the next third, etc. Give him time to chew and swallow between "bites". Thank you Talishan for the reply. I use a 1cc syringe with the tip cut off and I give about 0.2cc at one time, making sure he chews the syringe. But after that he somehow manages to remove the syringe out of his mouth and then it becomes difficult to put it back. And if I forcibly keep the syringe inside, he behaves like he is choking and as soon as it is out, he is normal and is still chewing. Should I still keep the syringe inside and continue, ignoring his little techniques? Quick update from the vet clinic. Sandy’s tooth was already broken and was hanging. It was pulled off and it started bleeding. Vet gave him Meloxicam and have asked me to give Perinorm- 0.2ml twice a day X 3 days and Metrogyl- 0.35ml once a day X 3 days. She has also told me to keep his wound clean by wiping it with diluted Betadine solution twice a day. I gave him the first dose of Perinorm. 4. Should I give him probiotic (poop soup) if I am giving him critical care? Should critical care be given one-two hours after antibiotic like a probiotic? Why is the vet trimming? Can the teeth wear on their own? With trimming (depending on technique), the tooth can be shattered down further. Filing can help prevent that. Can't answer all your questions - a pain killer certainly could help. Maybe go for a cue tip saturated with betadine so not much could be ingested. Unfamiliar with your antibiotics. Poop soup can help, shouldn't hurt.